Please meet my new guests, Severino and Arena. 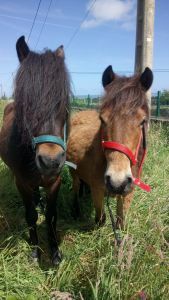 They are asturcon horses (http://www.ansi.okstate.edu/bre…/horses/asturian/index.html/) belonging to a friend. Used to living in the hills they are more used to wolves than people so not very socialised. However, they seem happy in their new place and curious about what is going on around, particularly the three horses on the vet’s land just opposite. The first day I went in to them but just stood still some distance away and spoke quietly. Severino came up and touched my outstretched hand. Then he allowed me to stroke his muzzle. When Arena, the little mare who is very timid, saw that he was happy there, she also came up and allowed me to touch her a couple of times before moving off again. I left it at that for the first encounter. They are lovely and I think they will benefit from more contact. The following day when we arrived they looked up and showed an interest which they had not done the previous day. I just left them while we were doing things and then before leaving I went in to them. Severino allowed me to walk right up to him and he accepted some apple from my hand. Then Arena came and also accepted a piece of apple but she dropped it and jumped back. I picked it up and offered it again and then took it and ate it, so I think they will gradually get used to the contact.